The TRANSPOSE procedure creates an output data set by restructuring the values in a SAS data set, transposing selected variables into observations. The TRANSPOSE procedure can often eliminate the need to write a lengthy DATA step to achieve the same result. Further, the output data set can be used in subsequent DATA or PROC steps for analysis, reporting, or further data manipulation. A transposed variable is a variable that the procedure creates by transposing the values of an observation in the input data set into values of a variable in the output data set. PROC TRANSPOSE does not produce printed output. To print the output data set from the PROC TRANSPOSE step, use the List Data transformation or another SAS publishing, summary, or reporting tool. 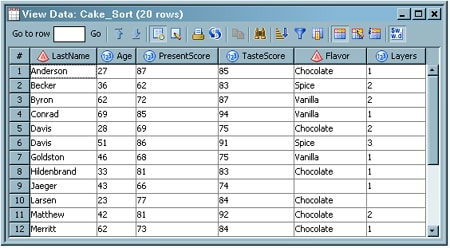 The target table that is created by this transformation contains only the columns selected to be analyzed. In addition, there is an informational column, _NAME_, which contains the name of the column that is to be used as the transposed column. There are also additional columns needed, depending on which type of transposition you are performing. Note: You should set Update the table metadata for the target tables to Yes. This action ensures that the proper columns are included in the target table. 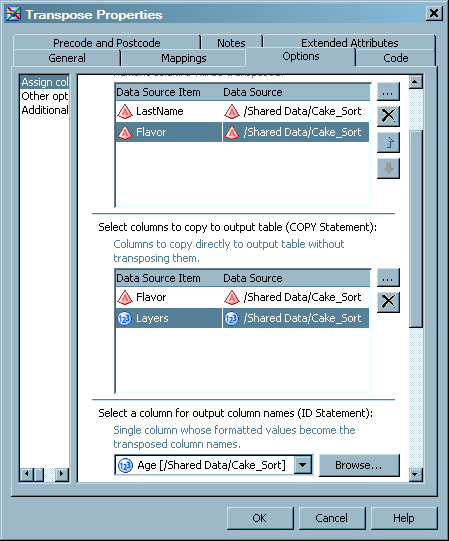 Alternatively, you can create the columns in the output table on the Mapping tab of the Transpose transformation property window. You must create the _NAME_ column and any other columns in the target table so that data is included in the final table. Verify that either the SQLGENERATION=System Option or the SQLGENERATION=LIBNAME Option is set appropriately. See “SQLGENERATION=System Option” and “SQLGENERATION=LIBNAME Option” in the SAS/ACCESS(R) 9.4 for Relational Databases: Reference. Specify one or more BY columns by selecting Options Assign columns Select columns whose values define groups of records to transpose (BY Statement). 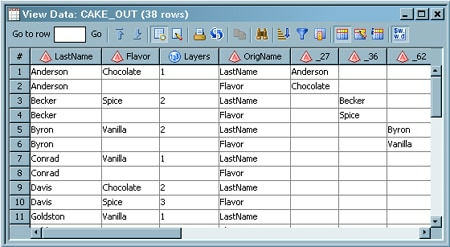 Specify one or more ID columns by selecting Options Assign columns Select a column for output column names (ID Statement). Specify the LET and INDB=YES transpose options by selecting Options Other options Specify PROC TRANSPOSE optionsand entering a value of ‘LET INDB=YES’ for this option. Ensure that all additional requirements for running PROC TRANSPOSE inside the database have been satisfied. For more information, see “Running PROC TRANSPOSE inside the Database (Preproduction)” in the SAS(R) 9.4 In-Database Products: User's Guide. You want to create a target table that contains transposed data. You can use the Transpose transformation in a job that transposes the data in a table and creates an ODS document that displays the transposed table. The transformation uses the TRANSPOSE procedure to load transposed data into a target table. Transposing the data in a table turns the rows in a table into columns and the columns into the rows. Select and drag a Transpose transformation from the Data folder in the Transformations tree. Then, drop it in the empty job on the Diagram tab in the Job Editor window. Select and drag the source table out of the Inventory tree. Then, drop it before the Transpose transformation on the Diagram tab. 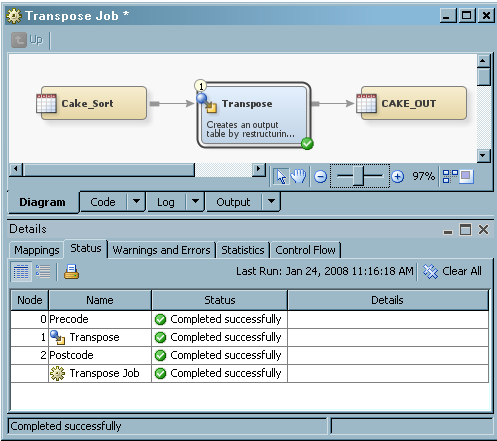 Drag the cursor from the source table to the input port of the Transpose transformation. This action connects the source to the transformation. Right-click the Transpose transformation, and click Add Output Port from the Ports option in the drop-down menu. This step enables you to add an output port to the transformation. 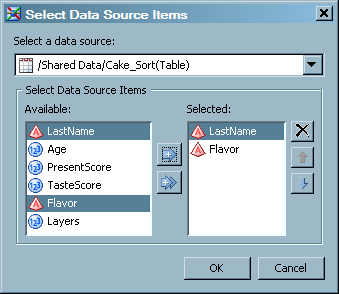 Note that the source table for the sample job is named Cake_Sort and that the target table is named CAKE_OUT. Open the properties window for the Transpose transformation in the Diagram tab in the Job Editor window. Then, click the Options tab. All of the values in the rows of the columns that you select in this window become values in a single row after the transposition is completed. In the sample job, the VAR statement columns are LastName and Flavor. Click Additional Options to access the Additional Options page. Make sure that the Update the metadata for the target tables option is set to Yes. This step ensures that the target tables contain the columns needed for the Transpose transformation to run successfully. Set remaining options as needed. For example, the sample job specifies system options, TRANSPOSE procedure options, and metadata update options. If error messages are displayed, read and respond to the messages as needed. Note that the values in the rows in the Age column in the source table have been transposed into columns in the target table (such as _27, _36, and _62).